Middle-income families are unable to afford the median-priced home in just over half of the country's 25 largest cities, and in the least affordable metropolitan areas, they aren't even in the game. Those are the results of Interest.com’s 2014 Home Affordability Study, an annual look at how the cost of buying a home stacks up against income and expenses in the nation’s metropolitan areas. “The bottom line is that buying a decent home remains a difficult or unobtainable dream for Americans in too many of the nation’s largest cities,” says Mike Sante, Interest.com’s managing editor. "In those cities with the least affordable housing, the failure of paychecks to keep up with rapidly rising housing costs is reaching crisis proportions. 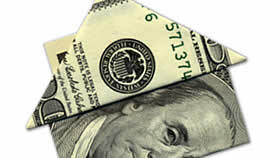 "In the least affordable cities, it's not uncommon for families to spend 50% or 60% of their income on housing costs. I've even had San Franciscans tell me that they must devote 70% of what they make to keep a roof over their head — and they were renting. Owning is out of the question." Last year’s study found a dramatic shift in the housing market as prices, recovering from the depths of the real estate crash that accompanied the Great Recession, soared in many cities. Nationally, they jumped by 12%, and the increase was even larger in the top 25 markets, with home prices rising 15%. This year’s study found something resembling sanity returning to the market. Across the country, home prices were up just 4%, while in the 25 biggest cities they climbed 6%. Yet incomes couldn't come close to keeping up, rising just under 2% nationwide and just over 2% in the big cities. To conduct our annual study, Interest.com gathers city-specific data on median home prices and incomes, average property taxes and insurance costs, as well as consumer debt and mortgage rates, from the most reliable sources we can find. The U.S. Census Bureau, National Association of Realtors, National Association of Insurance Commissioners and Experian, one of the three major credit reporting agencies, all provide information. Paycheck Power Rating, which is the percent the median income exceeds or falls short of the income required to buy a median-priced home. 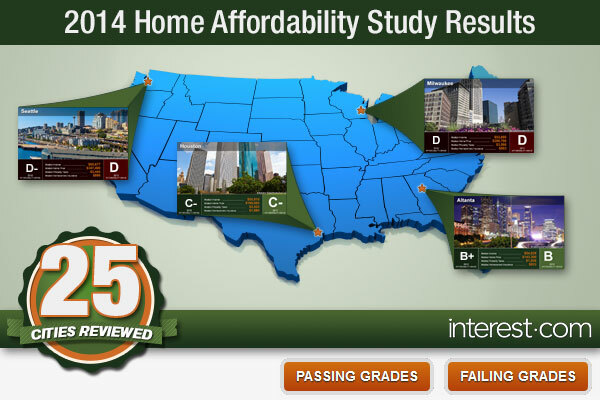 For the second year in a row, no city qualified for an Affordability Grade of A. (We don't grade on the curve.) Only three cities, Minneapolis-St. Paul, Atlanta and St. Louis recorded a B.
Minneapolis ends up in the top spot by virtue of its Power Paycheck Rating, which at 23.22% edges Atlanta’s 21.62% and St. Louis’s 20.46%. No other city had a rating within 6 points of those three. Herb Tousley, director of real estate programs at the University of St. Thomas in Minneapolis, says a combination of factors work in the Twin Cities' favor. One is a median income of $67,194, which is nearly $15,000 higher than the national average and also significantly above the average for the 25 biggest cities. The metropolitan area also has a large base of homes that fall within the range of those making a median income. “We have a big tranche of what I call middle-class, middle-priced homes,” says Tousley. Tousley and Emily Green, president of the Minneapolis Area Association of Realtors, both note that the city avoided the extreme real estate boom and bust that hit the Sun Belt and California over the past decade. Yet the Great Recession made many potential buyers super-cautious, which has kept the Twin Cities housing market from overheating, according to Green, an agent with Sandy Green Realty in Minneapolis. “We’re seeing (working) couples, first-time buyers, that are targeting homes they can afford on one income,” she says. Atlanta, which led our 2013 ratings, has seen its affordability grade fall from an A to a B+ to a B over the past three years. It was hurt in this year’s study by sharply higher home prices — a 16% increase that was more than three times the national average. Ennis Antoine, president-elect of the Atlanta Board of Realtors, says prices have been pushed up by a tight supply of existing homes for sale. Antoine believes the supply has been constrained by homeowners whose properties have only recently regained enough value that they are no longer underwater on their loans. “They have stabilized, and they don’t want to move yet,” he says. Even though St. Louis’ median home price climbed 9.74% to $149,900, housing in the city remained among the cheapest in the country, ahead of only Detroit and Pittsburgh. That, combined with a median income slightly above the national average, gave the city its solid rating. One characteristic the Twin Cities, St. Louis and Atlanta all share is open space for new home construction, which keeps the prices of existing homes down. The cities that fare the worse in Interest.com’s study are the opposite, hemmed in by oceans or oceans and mountains. As it was in 2013, San Francisco is the least affordable city in our study. It has a median home price of $769,600, the nation’s highest. A family earning the city’s median income could only afford a home worth $355,703, less than half that price. The yawning gap between home prices and the capability of representative working families to afford a home earned the San Francisco our lowest Power Paycheck Rating and an Affordability Grade of F.
San Diego, Los Angeles, New York and Miami are all coastal cities that also recorded an Affordability Grade of F.
Miami and Florida’s other big city, Tampa, which received an Affordability Grade of D, are both hurt by median incomes that, at $46,946 and $45,880 respectively, are the lowest of the major metropolitan areas. Median-priced homes in places like San Francisco and New York are likely to remain beyond the reach of all but the wealthiest families for the foreseeable future. But for the rest of the country, the experts believe the slowdown in rising prices that marked 2014 is a good sign for the future. Price increases are expected to remain modest in 2015, while mortgage rates are expected to rise by a point or so from current rates. After the roller-coaster ride home prices have been on the last seven years, the changes are expected to have only a moderate impact.